Only lightning will halt a football game in the NFL – and even then it will only be temporary. Both teams, and the fans should they choose, will simply wait until the weather has passed, and then they will re-take the field and face off. Very recently several games were delayed up to two hours because of this. Lightning aside though, the teams will simply play through it, battling the elements as well as each other. Here, in no particular order, are ten games that were played in brutal weather conditions, and perhaps because of this, are remembered as classics…. Referred to as “The Tuck Rule Game” or “The Blizzard Bowl”, the 2001 AFC Divisional playoff game saw the New England Patriots welcome the Oakland Raiders to what would be the last game at Foxboro Stadium. Along with the welcome, came several hours of heavy snowfall that resulted with the contest taking on the appearance that it was being played in a snow globe. The snow continued to fall throughout the contest, and it appeared as if the north east weather of the United States had worked against the home team, as they trailed the Raiders 13-3 going into the final period. The Patriots managed to pull to within three and with just over two minutes remaining they were driving against both the snow and the Raiders, into field goal range. Charles Woodson appeared to have wrapped up the game for the visiting Raiders when he blindsided quarterback, Tom Brady, on a corner blitz, allowing linebacker Greg Biekert to recover the football. It was ruled a fumble, but the play was immediately reviewed. It was eventually ruled that Brady had not tucked the ball back into his body before the fumble, and was therefore an incomplete pass. The call is debated to this day. The Patriots battled into field goal range where kicker Adam Vinatieri netted one of two of the greatest kicks in NFL history that he made on that snow-covered evening. The game went into overtime, where the snow continued to fall, as did the Raiders confidence, as the Patriots eventually claimed the win 16-13 off the back of a 23-yard Vinatieri field goal midway through the extra period. Perhaps you could forgive Philadelphia sports fans for thinking their teams really were cursed, when the Philadelphia Eagles reached the NFL Championship game in consecutive years following the 1948 and 1949 campaigns, they had to battle their opponent and Mother Nature on each occasion – and each time, they were successful - their only championships in their history. In 1948 the Eagles welcomed the (then) Chicago Cardinals to Shibe Park to contest the championship of the National Football League. 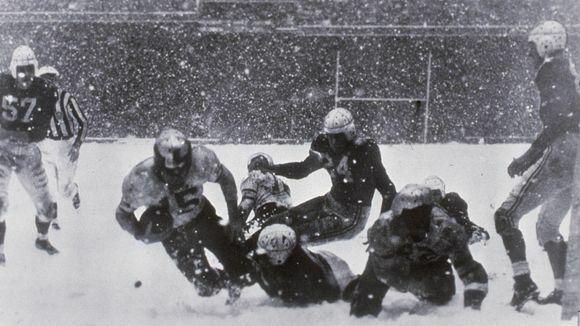 The contest was played in a thick snow blizzard – so heavy that the grounds crew had to enlist the help of players from both teams to remove the tarp from the field. The Eagles bagged the win 7-0, scoring the only touchdown of the game when Steve Van Buren went in from 5 yards out late in the fourth quarter. ​ The following year the Eagles traveled to Los Angeles to defend their title against the Rams. However instead of playing under warm California sunshine at the Los Angeles Memorial Coliseum, the Eagles were treated to a torrential downpour. The field eventually became a mud-pit, but the Eagles scored touchdowns in the second and third quarters to take their second NFL crown, 14-0 over the home team Rams. The 1988 NFC Divisional playoff contest played on New Year’s Eve 1988, was much anticipated, as it finally had the Bears’ former defensive co-ordinator and his Philadelphia Eagles on a relatively even keel with his former team. The contest began under bright sunshine at Chicago’s Soldier Field and it appeared the home side had the upper hand, as Mike Tomczak launched a 64-yard touchdown strike to Dennis McKinnon to take a quick 7-0 lead. They were leading 14-6 by the time the fog rolled in from Lake Michigan. Within minutes it was so thick that the players couldn’t see more than twenty yards in front of them, much less could anyone in the stands see what was happening. The game was halted briefly to contact the NFL head office in New York as to whether or not to postpone the contest. 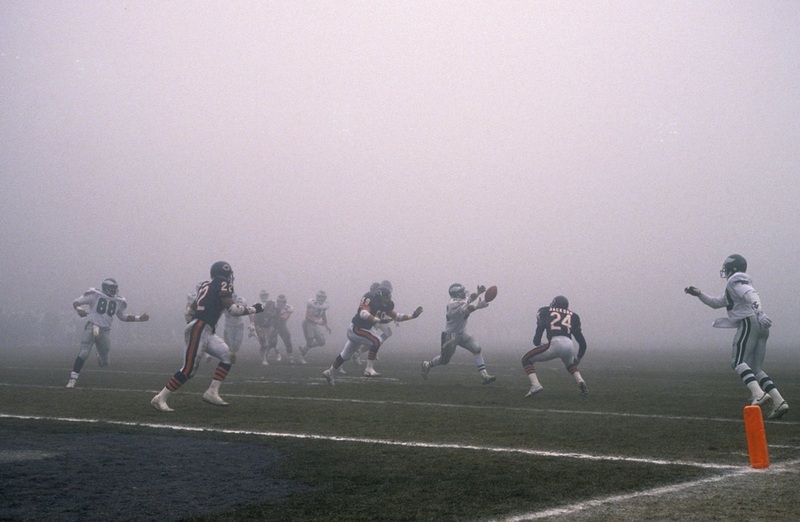 It was decided to play on, with fog not lifting until late in the contest – which the Bears held on to win 20-12. Perhaps understandably, many Eagles players and fans felt robbed that the weather had played such a part in the game, not least Buddy Ryan, who promptly left the field without shaking his counterpart, Mike Ditka’s hand. ​ Still regarded as one of the most bizarre games in NFL history, Eagles quarterback, Randall Cunningham actually put up some huge numbers on the afternoon, throwing for 407 yards but was unable to get his team into the end-zone, which is ultimately what cost the visitors in what became known in NFL folklore as The Fog Bowl. On 26th December 1977, the Los Angeles skyline brought with it a late Christmas present for the visiting Minnesota Vikings. As they prepared to face off against the Los Angeles Rams in the Memorial Coliseum for the right to advance to the NFC Championship game, a torrential downpour soaked Los Angeles. The field was quickly turned into a huge rectangle of mud and a game that would be referred to as “The Mud Bowl” by future generations was played out. The Vikings, who were playing with back-up signal caller Bob Lee in place of the injured Fran Tarkenton, scored quickly following a Rams’ turnover that Chuck Foreman cashed in from 5 yards out taking a 7-0 lead – a lead they held until the final period when they extended it to 14-0 when Sammy Johnson plunged through Rams and mud alike from a yard out. ​ With each team being a body and legs of brown, it was only by their helmets that players could be told apart, if only by their teams. The Rams did score late in the contest, but by then the result was not in doubt and the Vikings returned to Minnesota with a 14-7 victory in their pocket. 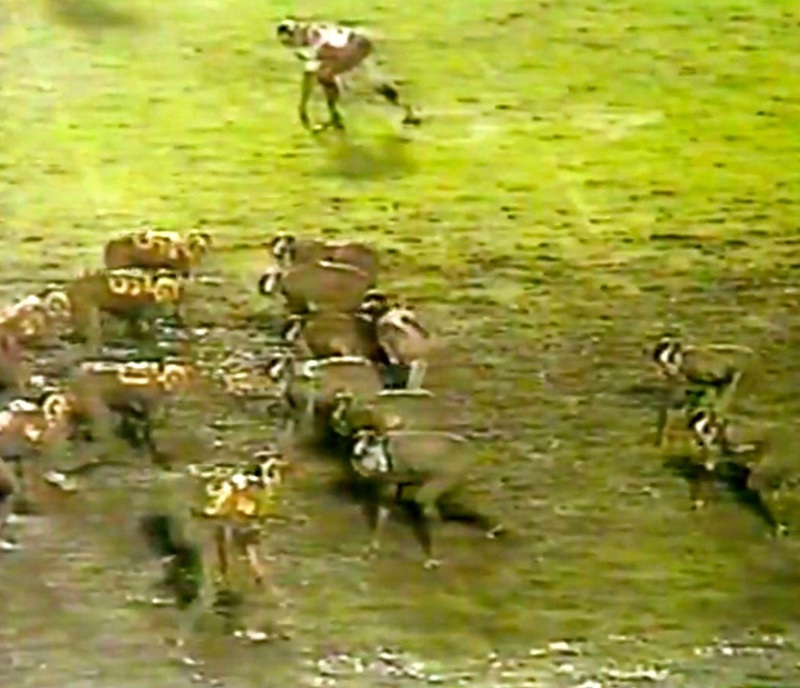 The 1977 NFC playoff game between the Vikings and the Rams literally was played in a "mud bowl"
After beginning the 1979 campaign 5-0, the Tampa Bay Buccaneers still entered the final week of the regular season needing to beat the visiting Kansas City Chiefs in order to guarantee a playoff place, and win the NFC Central division in the process. Of course, after losing their first twenty-six games over the course of their first two seasons beginning in 1976, you might think the Buccaneers should thank the Lord for having come this far. Perhaps to prove a point, as the final regular season Sunday dawned, in Tampa, Florida, it did so under biblical-type grey skies and monsoon-like rainstorms. Rainfall of this kind had not been known in the Tampa area before and at the stadium itself not only was the field soaked and drenched with rainwater, there was water flowing freely down the steps of the stands. ​ Needless to say, scoring was low and at a premium. The contest remained scoreless until deep into the final period, when Neil O’Donohue nailed a 19-yard field goal to seal the 3-0 victory and sending the Buccaneers to the playoffs for the first time in their short history. 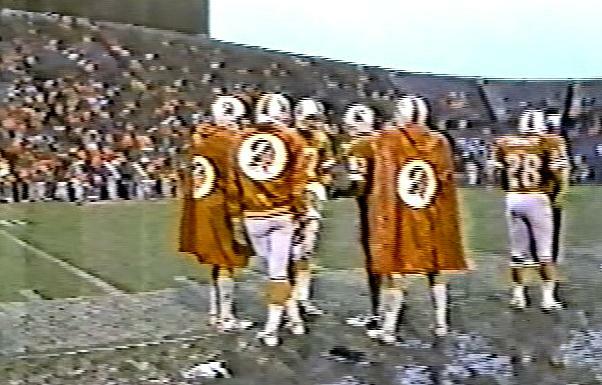 The Buccaneers season finale of 1979 was played under "biblical" weather conditions. 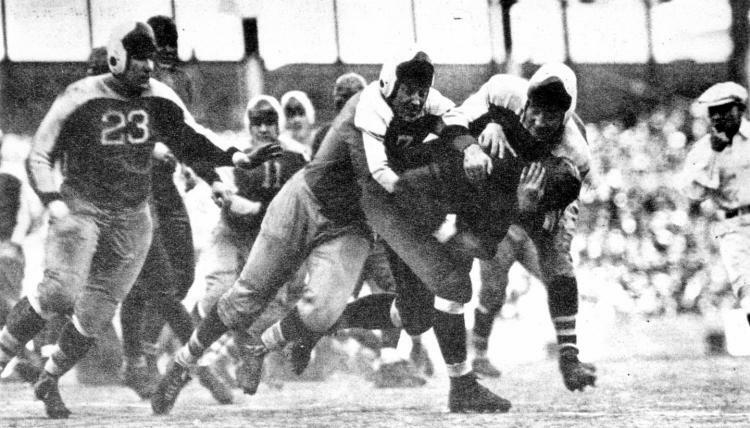 On 9th December 1934 at the famous Polo Grounds in New York, the Chicago Bears and the New York Giants prepared to battle it out in the NFL’s second ever scheduled championship game. The visiting Bears were the heavy favourite, entering the contest having won all thirteen of their regular season games. The Giants by contrast had notched up eight wins against five defeats. A freezing rain the night before the contest had left the field as hard as ice, and as the Bears went out to a 10-3 lead, Giants’ head coach, Steve Owen, noted how sneaker shoes would give his team better traction on the slippery surface. Legend has it that Owen sent a Giants assistant to nearby Manhattan College, where he emptied the lockers of the basketball team of any sneakers he could find. He returned to the Polo Grounds midway through the third period with a total of nine pairs – the Bears now leading 13-3. ​ The home side quickly changed the footwear, and scored twenty-seven unanswered points in the final period of the contest, their traction on the ice-like field now much better than their opponents. On New Years’ Eve 1967, the Green Bay Packers and the Dallas Cowboys, awoke in Green Bay, Wisconsin to temperatures of minus fifteen degrees as they prepared themselves for the 1967 NFL Championship game. The game was so cold that it was played without the referees blowing their whistles after a referee had a piece of his lip torn off after removing his whistle from his mouth on the game’s opening play. Despite the brutal weather conditions, the contest progressed normally at first, with each side moving the ball on the other en route to a 14-10 half-time advantage for the defending champion, Green Bay Packers. However as the second half progressed and the already below freezing temperatures dropped even more, the contest took on a more desperate feel, as the players battled the cold as well as each other. Dallas took a 17-14 lead over the Packers on the first play of the final quarter when half-back Dan Reeves launched a 50-yard strike on a half-back option play to wide receiver Lance Rentzel. They still had the lead with a little under five minutes remaining in the contest, when the Packers took over possession of the ball at their own 32-yard line. ​ In what would arguably be their greatest offensive drive of the Lombardi era, Bart Starr led his Packers down the field, eventually calling time-out at the Cowboys’ 1-yard line with sixteen seconds remaining. Instead of opting to kick the field goal and send the game into overtime, Starr stated to coach, Vince Lombardi, that he felt he could get enough traction to sneak the ball over the goal-line and ensure the win. Lombardi went with the call, and Starr led the offense onto the field again. Three seconds of game-time later, Starr was in the end-zone and the Packers had all but sealed their third straight NFL championship and would be returning to the Super Bowl - at the time, the second such game. 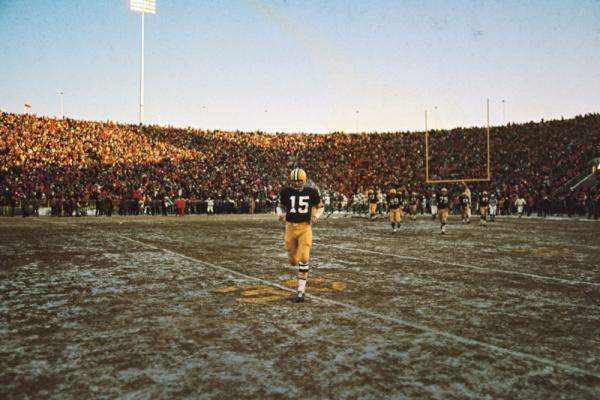 Bart Starr comes to the sideline before the final play of the Ice Bowl - note how frozen the ground is. In week six of the strike-shortened 1982 regular season, the Miami Dolphins’ visit to Sullivan Stadium to face-off against the New England Patriots, was about to become enshrined in NFL legend, not just due to the brutal snow fall it was played in, but for how the Patriots overcame the brutal conditions. ​ Each team struggled to move the ball throughout the contest, with the game still scoreless deep into the final period. The Patriots though finally started to steadily move themselves into field goal range. When they finally got to where they felt kicker, John Smith, could convert from, they called time-out, and then promptly sent out a prisoner on day release who was operating the stadium’s snow plow, to drive onto the field and clear a space for Smith to have the ball placed and for him to make a clean run at it. Much to the dismay of Dolphins’ head coach, Don Shula, the driver of the snow plow did just that, and Smith converted the field goal for the only score of the game and a 3-0 victory for the Patriots. A space is cleared during a time-out for the Pats to kick the game-winning field goal. 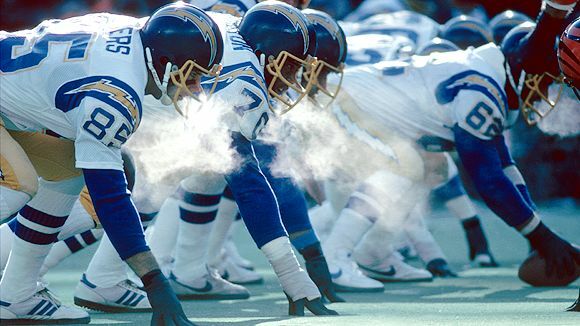 The cold conditions on 10th January 1982 that accompanied the 1981 AFC Championship game, not only robbed the San Diego Chargers of a chance at Super Bowl glory, but arguably deprived the NFL world of seeing one of the greatest teams of that era realise it’s full potential. After coming off a dramatic overtime victory over the Miami Dolphins in the stifling heat of south Florida the week before, the Chargers now traveled to Cincinnati’s Riverfront Stadium where they would face the Bengals in what become officially, the coldest game in NFL history, with a game-time temperature of minus thirty-seven and a wind-chill of minus fifty-nine. ​ The Chargers high-powered offense also appeared to freeze along with the weather - after racking up forty-one points the previous week, they were held to only seven in Cincinnati, as the Bengals clawed their way to victory, 27-7. Long before it was the norm to do so, when head coach, Bill Parcells, opted to take the wind instead of the ball when his Giants won the coin toss before the 1986 NFC Championship game, it was just another example of how much ahead of the curve he really was. With thirty-two mile-per-hour winds blowing through Giants Stadium, Parcells forced the Redskins to head into it to begin the game – they never recovered. Not being able to move the ball, and constantly deep in their own territory, the Redskins soon gave up quick scores to the Giants, and by half-time they were trailing 17-0. ​ The game was scoreless in the second half as the Giants bullied their way to Super Bowl XXI. It could be argued aside from Parcells master call regarding the coin toss, that punter Sean Landeta was the key reason the Giants won the game, as he constantly kicked solid punts into and with the wind all afternoon keeping the field short for Big Blue and long for the Redskins. 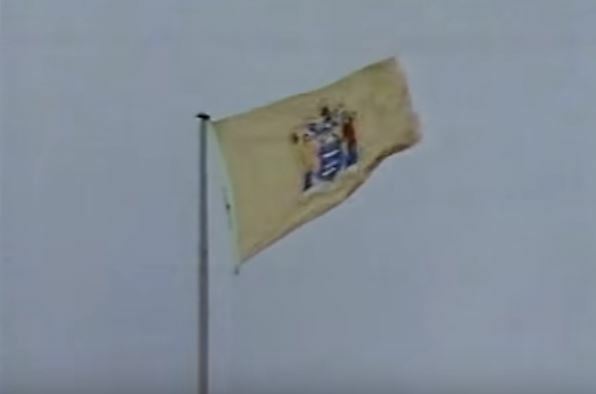 One of the flags on the top of Giants Stadium - testament to how windy the 1986 Championship game really was. 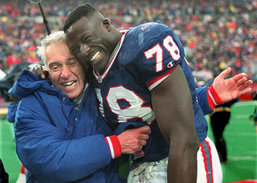 In Marv Levy's Buffalo Bills - The Best Second-Best Team in NFL History we look at just what an achievement it was to reach four consecutive Super Bowls and where Levy's Super Bowl teams belong in NFL history, despite them not winning any of the big game appearances.